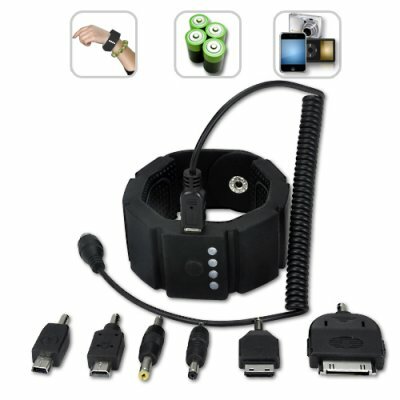 Successfully Added Wrist Band Portable Battery - Black to your Shopping Cart. Wrist Band Portable Battery - The most stylish and convenient option for an emergency power supply. Scenario A: You’re going on a long trip so you bring your iPhone and PSP gaming console with you. Alas the trip is so long you run out of battery power half way to your destination. Scenario B: You’re in the middle of a very romantic conversation when your cellphone battery dies! Or more importantly you’re playing Bejeweled and you’re almost done the game and then…blank screen! Or should we say blank SCREEEEEAM?! Scenario C: You’re camping in the middle of nowhere and your MP4 player runs out of power just when it gets to the good part in LOST The TV show where (spoiler alert…) Michelle Rodriguez gets shot!!! You will never have to chance such scenarios if your wrist band is able to charge your gadgets instantly. Both fashionable and practical, this Wrist Band Portable Battery was designed to easily and quickly supply extra power to all of your popular portable electronic devices. It comes with an extendable stretch cord and 6 different power connectors that will provide many more hours of usage for most major cell phones, MP3/MP4 players (including your iPod) ,PSP, and similar handheld electronic gadgets. Also included is a set of LEDs which will indicate the remaining battery life. This is one of those times you need to hit that add to cart right away. Don't delay! Brought to you by Chinavasion, the leader in tech gadgets and wholesale electronics. How long should I charge this product before first use? It's a battery. Of course it's not waterproof. Moisture from sweating is okay. Protect it from rain though. I love this product, but does it come in any other colors? Yes it does. Please refer to the CVOM-G184-WHITE. Upon unboxing, i was disappointed as it doesn't have the micro usb for Samsung Galaxy S2 but good I thing I did find a f-mini usb to m-micro usb. It is an excellent backup power because of its portability. It did charge my SGS2(turned off) upto 50%. During usage, it can sustain the device upto 1 hour of heavy usage + as charger dries up, it left 25% in the battery. Excellent! First off, shipping was great. Only took twelve days and it was on the slowest setting. As for the product, it works; however, it doesn't work for the items I wanted it too. My cellphone is standard (LG), but sadly will not work for it. Right now I only have a use for this to charge my DS and that can be used constantly for ten hours and can go over 3months without use and still hold some power in a previous charge. Also it doesn't look as bulky as it appears in the photographs and it is comfortable. I'd just check to see if it'll work for what you want before you purchase it. Fast delivery. Good and useful product.